These beachy Mason jars can’t help but ooze vintage seaside charm! Of course, craftiness can look completely different from person to person, and that’s what makes it your own! Like mason jars, for example. There are tons of DIY options for mason jars, from lanterns to holiday decorations. So, I took the idea I liked best (painting them with vintage paint) and just put my own tiny twist on it: an alternating color duo of dusty aqua and white along with, of course, starfish. Had I ever painted mason jars before? Nope, but why not give it a try! Here’s my adventure into “being crafty” with mason jars — glad to have you along for the ride! 2. 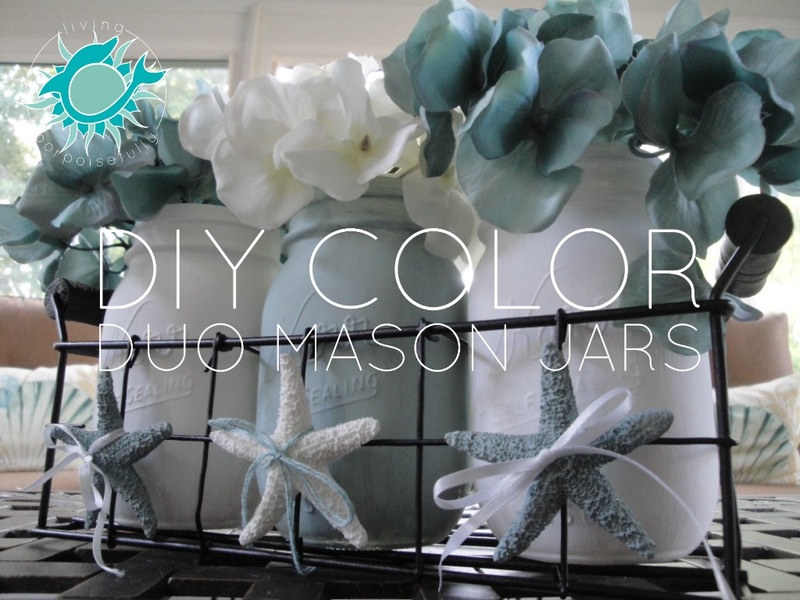 Then I painted the mason jars: one dusty aqua and two white. I did a couple of thin coats with downward brushstrokes. 3. Paint two of the mini faux starfish with the aqua color (leave one of the starfish white). Did I plan on painting them at the start? Not at all, but it was an idea that came up along the way to go with my color duo theme. By the way, I really like using faux sea life whenever I can (unless I found it dead on the beach myself) so that I know it’s not depleting the species. Many shell shops are unfortunately causing the demise of many shelled sea creatures. 4. Once dry, tie the starfish to the wire basket with thin ribbon. I originally thought I’d use twine, but I ended up liking the thin ribbon better. For the white starfish, I grabbed a thread from a piece of burlap ribbon that was the same dusty aqua color that I had bought for another reason. It worked nicely! I also removed the bottom ring of flowers (figured out you can take them off from the top end of the flower) since it was a little too full for the small mason jar. 6. I went back and forth on this one for awhile: to distress or not to distress? In fact, I even finished the whole craft and then went back a week later. Yes, it took me a week to finally decide to try distressing it. Worst that happens is I re-paint it, right? So, I ran some sandpaper (you could also use a nail file) over the jar where the letters were. 7. Put the mason jars in the wire basket, and then the flowers into the mason jars. And now we have a coordinating set in our sunroom, with the colors just our style. So, the next time you think “I’m not a crafty person,” don’t let it hold you back from trying something that you just might be proud of! Give it a shot, and let go of being perfect. It’s a lot of fun to make something that’s so “you”! Next Post We’re on Facebook!